We all want to have Personal Development, and that begins with awareness of our selves - how we think, how we feel, how we respond, how we do what we do, what our strengths are, what our gaps are, where we want to go, what our needs are etc. Awareness is knowledge for decision making and for driving action. But sometimes, it's hard because of our emotions, our fears, our over-analysis of the possibilities as we transverse between our past, present and future. Breaking out of that can be aided by an expansion of perspectives, learning vicariously through the sharing of others, evaluating the stories we tell ourselves, and re-wiring that with empowering ones that can drive us forward. We know how important this is because we've all been through it. We've all been through transitions - from one school to another and out into the working world, from living with our parents to living with our partners and to being a parent, from one job level and role to another, from company to company or country to country, from being in a job to being out of one, from being together to losing a loved one; the transitions in our lives are aplenty. Transitions are difficult because everything is so uncertain. We think that as we grow older, the wiser we become and the better we know to guide ourselves in life. But no one ever knows what to expect and we can only keep trying. Sometimes, it can be really challenging, and the best way to know how to move forward is when we look within ourselves to find courage and our answers, and when we can reach out to others to gain the perspectives and support we need to move forward. We all experience transitions differently. What holds a person back could be very different for another. That's why self-awareness is key - it is key to understand emotions and break through the invisible barrier, it is key to illuminate the path ahead for oneself, and it is key to identify the gaps we need to act on to take us forward. Personal Development begins with Self-Awareness. Look within to find the answers you seek. Identify your employability mindset, discover what's missing for your happiness, build mental toughness, experience coaching and much more! Reconnect and Rediscover yourself! 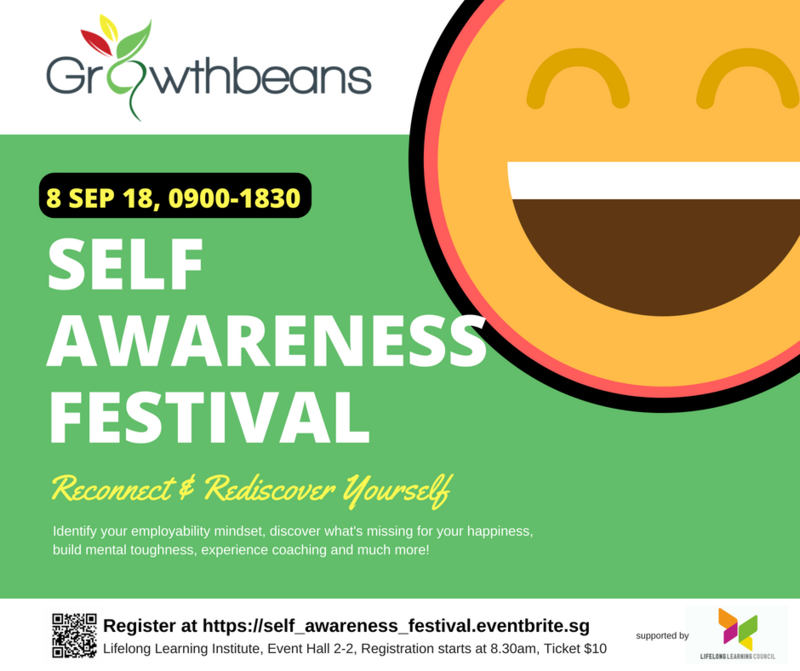 "Self-Awareness is the beginning of wisdom, personal mastery & success"
​Discover more about yourself at the Self-Awareness Festival – a one day event that empowers you to reflect, take charge and take action for your growth and development! Whether it’s to boost your confidence, to be a better communicator, leader or entrepreneur, there is something for everyone. ​Join us to discover your purpose and passion, take steps to develop yourself and your career, and connect with a diversity of people for the support you need. What’s more, get access to life coaches – individuals who raise your self-awareness, keep you accountable, and help you become who you want to be - on the spot!